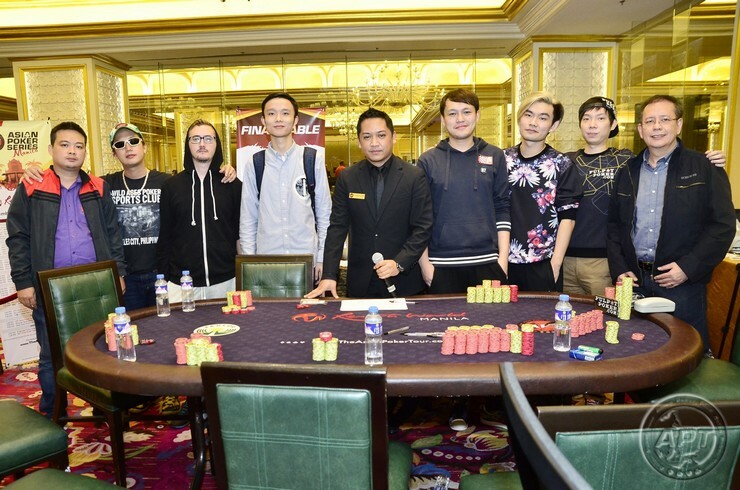 After a long nine hours of play, the eight-handed final table of the APT Asian Poker Series Manila 2015 Main Event has been set, here at Resorts World Manila in Pasay City, Philippines. Completing the final table are Vietnam’s Le Ngoc Khanh with 934,000; the Philippines’ Jun Javalera (759,000) and Luke Pangan (479,000); Korea’s SJ Kim (582,000); and the lone European among the Asians in the final table, Germany’s Herbert Baum (371,000). Loon’s run to the top began late in Day 3 when his A♠ A♥ couldn’t be cracked by Zhang’s 10♦ 10♠ on the board 3♥ 7♠ 3♠ 6♥ 8♦. At that point, the Singaporean neared the 1M mark and he remained among the leaders until the day ended. While Zhang got hit big by Loon in that level, the Chinese recovered in just two hands; first, he bad beat Javalera’s A♠ K♠ with A♦ 4♠ in a pre-flop all-in with the board reading A♥ 5♣ 6♥ 2♠ 4♣. When play was 10-handed, he crippled erstwhile chip leader Thomas Ward when he held K♥ K♣ to Ward’s Q♠ Q♦. Day 3 started play with 51 players in contention and after two hours and a half of play, the ITM round was reached with Minsoo Kim of Korea being the unfortunate bubble boy in this main event. Curiously, it was Pangan who was responsible for both bubbles of the day; first, he ousted Minsoo holding 10♦ 10♣ against the Korean’s 6♠ 6♣ on a board of Q♣ 2♦ 8♣ 4♦ K♥. Later on, he eliminated India’s Paawan Bansal, whom Pangan caught bluffing on the board A♦ 6♣ 2♣ 10♠ 3♣. The Indian pro shoved on the river with 7♣ 2♥ and the Filipino called him with 10♥ 5♥. 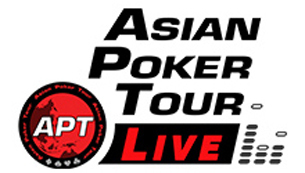 The final eight players will battle for the APT title and the champion’s purse of PHP 3,758,200. Among the notables who finished in the money were; Ward (10th), Roger Spets (18th), Linh Tran (19th), Kai Paulsen (21st), Marc Rivera (23rd), Bryan Huang (27th), and John Tech (28th), among many others. For complete payout list, check the Live Updates page. 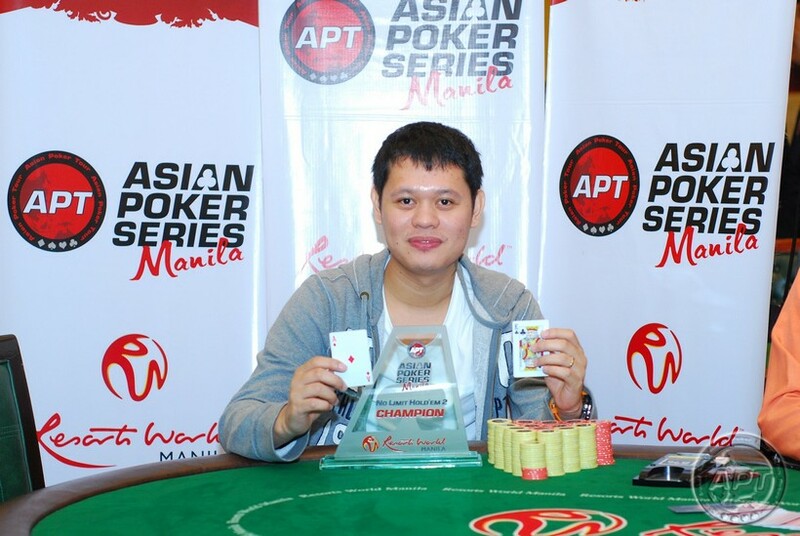 Meanwhile, Jessie Leonarez of the Philippines bagged the title in the No Limit Hold’em 2 event also on Tuesday. Aside from the Final Table, one more side event is scheduled on Wednesday at 1:00 PM, the 6-Handed Turbo event with PHP 11,000 buy-in.